Safe training guidelines and basic principles of Circular Strength Training. Basic features and leverage training advantages of Clubbells. Performance breathing and correct posture to maximize the benefits of your practice. Basic Positions: Floor Park, Order, Shoulder Park, Chest Park, Back, and others. Ballistic Exercises: Various Swings, Cleans, Pendulums, Circles, and other moves. Grinds: Arm Cast, Shield Cast, Parry Cast, Head Cast, variations and more. Advanced Moves: Drumming, Seesaw, Leverage Press, Muscle Out and more. Combinations: Swipes, Mills, Warrior Be Strong, Moulinet, and many more. It’s easier to learn movements once you’ve seen them done correctly. 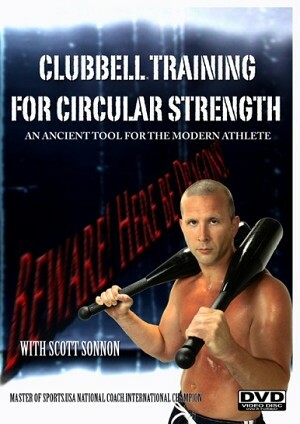 Strongly recommended for Clubbell® users of all levels, the Clubbell® Training for Circular Strength DVD is one of the best training investments you can make. This video has a running time of 56 minutes.